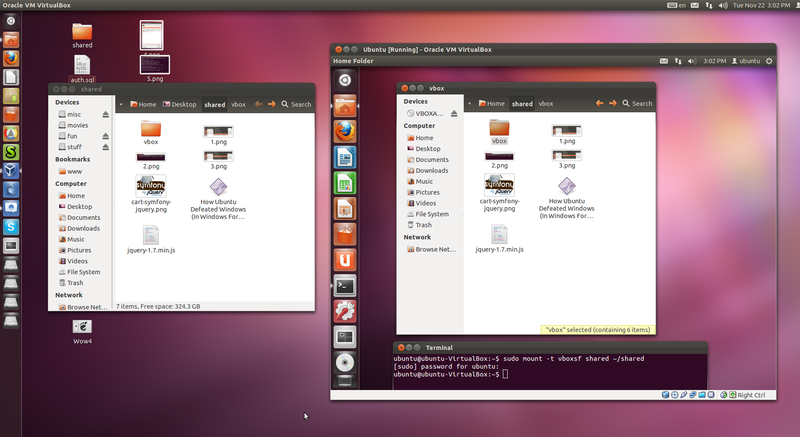 Since Ubuntu 11.10 use a new kernel, it's very difficult to have a decent support for virtualization. VirtualBox doesn't support guest additions for ubuntu 11.10, so I can't copy to and from my ubuntu desktop and windows, which I absolutely require, plus FreeBSD seems not to be able to use DHCP without guest additions. The problem is solved by running virt-manager as root, but I don't like that. How do I change permissions to run Virt-Manager as user? 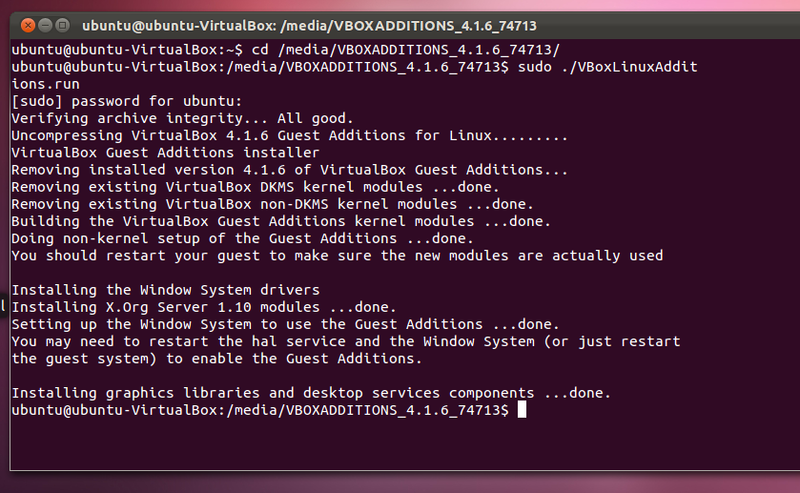 Is there a way to install guest additions on Ubuntu 11.10? Since you installed the needed packages in step 2, you should be fine after installing the Linux Addition since it will configure with no problems. Say yes to a question or two it might ask but this will not do you harm since it will be checking to see if you have the guest addition installed already. Reboot after finishing the install. Now when the guest starts again you should see that you have several new options available like input devices, views, etc.. but the one you are needing is SHARE FOLDERS!!. To share a folder you already know that is done from the Virtualbox Menu. Now you can access the shared folder. The name of the shared host folder must be the same as the guest folder. In the example mentioned above you have both named virtual, but it could be both named bck, shared, virtualbox, etc... This will solve several "protocol" errors. To automount a share folder add it to /etc/fstab. This way when you load the guest it will have the shared folder already mounted. If (JUST IF!!) you by change have a editing/saving problem directly in the shared folder. Just copy over the file to another place. Edit the file, save it, copy over back to the shared folder, replacing the one in there. If you are using Windows Vista and up, by simply installing the Guest Addition, Sharing the folder (The same procedure as in the Ubuntu example) and rebooting the Windows Guest session you will automatically see the Shared folder between both systems. If you are using Windows XP, 2000 or 2003 you can use the answer shown in: How do I set up shared folders in a Windows XP virtualbox guest? To do the sharing via a command line, Takkat has a nice tutorial in How to access a shared folder in VirtualBox? and in How do I set up shared folders in a Windows XP virtualbox guest? Red Hat Virtual Machine Manager supports KVM, Qemu, and Xen, but not Virtual Box that comes with their own graphical or command line management tools. For full support of all features (incl. USB 2.0 and RDP) the installation of the up-to-date closed source or PUEL version (free) of Virtual Box is recommended (see this answer for details). After that guest additions need to be installed on the Ubuntu guest as is further elaborated in this answer. For shared folders usage see here. Not the answer you're looking for? Browse other questions tagged virtualbox virtualization shared-folders or ask your own question. How to access a shared folder in VirtualBox? How do I set up shared folders in a Windows Virtualbox guest? 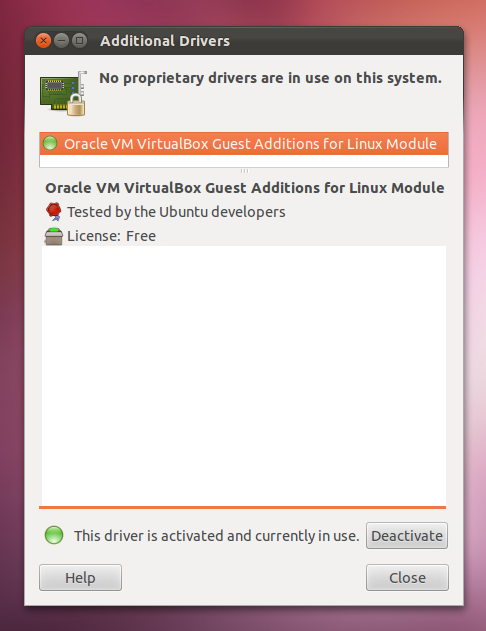 How to share folders between host (Mac OS) and guest (ubuntu) os with VirtualBox?